Kevan Budd's name came to prominence in the Elvis world due to the sensational audio restoration work he carried out for 'Elvis At Sun' in 2004. As part of the 50th anniversary celebrations of the birth of rock'n'roll this brought us the definitive CD versions of Elvis' astounding Sun recordings. 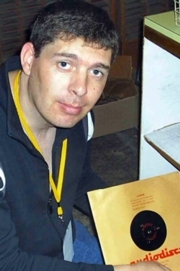 Kevan Budd followed up as the audio restorer with the 'mainstream' BMG re-releases of Elvis' first three albums in 2005. At last Elvis fans had these all important LPs available and in the quality they deserved. Recently FTD released the extended 'Loving You' soundtrack compiled & mastered by Kevan & which included some extraordinary audio restoration work. EIN always gets asked for information & audio restoration is a popular theme, especially as fans have often bought the same RCA product several times before. So it is with our thanks that Kevan agreed to take time out for an interview with EIN. EIN- Kevan what was the very first Elvis project you got to work on? 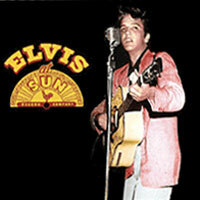 Kevan Budd: `Elvis at sun` and the `that’s all right` single release were the first. EIN- Do you consider 'Elvis At Sun' as you best or most important release and what track stands out to you as the most memorable to work on? KB: It was probably the toughest so far, and it could be seen as the most important, though I do feel every Elvis project `no matter what` is important. 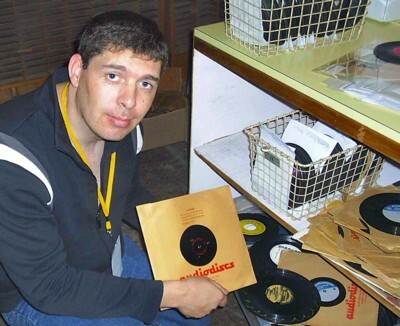 Most memorable would probably be `milkcow blues boogie` as I traveled everywhere making transfers of original Sun records trying to improve on the old RCA copy, eventually I found a copy which would be good enough to use in part, once restored. Though it almost got overlooked as the start and end were a complete mess. In the end the track was made from 3 separate parts pieced together. `Blue moon` also sticks in my mind as it was the most badly damaged tape. EIN- You seem to have done an amazing amount of work for BMG in the last 2 years - How long does each 'project' take you? KB: Each project varies, but I will always take as much time as I possibly can, as I always feel I can get a little more from each project! The 2005 DSD remasters took a few weeks, yet the Sun box set is years in the making! EIN- As most fans know, Elvis' 1956 Masters were terribly mastered for the original '50's box-set'. The release "Elvis 56" seemed to correct that error but then your version of the first two albums see yet another improvement. On yours the peak-distortion on Elvis' vocal is fixed and tracks like "I'm Countin On You' are sublime. KB: You have to start work by researching the tapes available, there were some new tapes used for those releases, though in many cases there are several tapes where its not clear which is the lowest generation master, so I will go through them, thoroughly checking them all, however even when you find the best tapes there are still often sound problems that have to be researched and fixed, followed by getting the other tracks that were not from the new tapes up to the same standard or as close as possible, which can be a painstaking process. Regarding the dynamics I always try to leave the peak dynamics intact as you only have to increase the vol control on your hi fi if you want it louder at no cost to fidelity. EIN- Let's talk about the brand new FTD release of 'Loving You'. Can you tell us more about the new Paramount tape or tapes discovery? KB: These were acquired by Ernst Jorgensen in mid 2005 a few months after the Jan 2005 DSD `loving you` had been released, I was thrilled we had new tapes. From a restoration point of view there was a slight headache as several songs on the tapes were cut short at the ends and had to be repaired. EIN- Were these only a "compile" or were there session tapes found too? KB: These were a compile, unfortunately no session tapes were found. EIN - Some of the Jan 12-13 'All Shook Up' session studio masters seem to be lost forever. Is the only remaining tape the "Golden Records Vol 1" RCA compile? Is this where you recovered the cute '1,2,3,4' intro from? I presume that if there was anything extra on that tape you would have used it? KB: Unfortunately we have nothing more for `all shook up`, the tape used was the original master compile tape, where the masters were cut from the session reel and compiled on one reel, this is a better tape than the gold records LP tape and the best source there is. I loved the count in for `all shook up` and it was used as it fit so well with the song, it didn’t distract from the feel of the master. EIN- Was there anything at all from the 'Loving You' tapes that you didn't use? For instance is there a lot of studio banter that gets left out? KB: No. this release was to be as complete as possible, so we included everything we have that we could use on the set. EIN - The lazy late-night coolness of the new J-16 'End Version' of Loving You on CD 1 has to be the best version of the song I have ever heard. What did you think when you first heard this off the new tape? And what about the new 'Mean Woman Blues' discovery? KB: Oh I totally flipped; those two tracks were a pure joy to listen to. 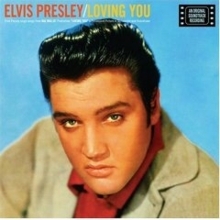 I also felt the new loving you J-16 was the best I had ever heard, but I was hoping the fans would not overlook this gem, because it was "another take" of `loving you`. EIN- Off the Loving You CD 2 session I've selected several of these new takes as my all-time favorites (like KX Take 3 with some fabulous jazzy piano work or the rough version of KX16 with the sloppy ending!) do you have any favorites? KB: Personally my favorite is KX - 21, I feel this take and the new J -16 are very solid versions of the song. EIN - Tell me about the acetates? I cannot believe the improvement over the previous versions. I would label 'Blueberry Hill' as a brand new release it is that different to the same version on 'Platinum'? Did you find new tapes? KB: No these are the same acetate copies as before; I tried in vain to find better copies as `Blueberry hill` in particular was a complete mess, pretty much destroyed. It took a lot of time with 3 restoration attempts made from scratch, over a period of about 4 weeks in total. A little detail I can add is that we only recently found out is that `One Night of Sin' was listed by the engineers at the time on acetate as `one night of sin (Elvis special)', rather than the usual take number etc. EIN- how do you decide what your final product should sound like? Are you aiming to duplicate the sound of the original tape recording in the studio, the 45rpm vinyl release, the LP release? The sound engineers doing the recording at the time were first class, they knew what they were doing and more often than not got the sound just right there and then. However the post production for the record release was often done for the radio at the time, being highly compressed and bandwidth limited and this does not always stand up today. Therefore I try to go back to the tapes before the post production where possible if I feel this will give an improvement. EIN- We know that Elvis often complained of what RCA did to his recordings when they came out on vinyl. Do you think Elvis was justified? KB: Yes, on the whole I think Elvis was right! Kevan Budd searching through a radio stations acetates where Elvis is known to have performed. Unfortunately there was no Elvis found that day ....it's just part of the continued search. EIN - I believe that you are working on the SUN box-set. Do you just work on the music or are you involved in the whole project? KB: I like to help with all sides of the releases where possible, especially the ones I am working on, traveling to the USA in August 2005 with an Italian friend and again just with Ernst this past January looking for new material, we were fortunate to find many great unreleased 1954-55 pictures on these trips and off course we continue to hope that more audio will surface…fingers crossed! EIN: Thanks so much for your time & I'm looking forward to talking again in the future. KB: It's been a pleasure, thank you. Kevan Budd was interviewed by Piers Beagley for EIN, February 2006. - Copyright Elvis Information Network 2006.